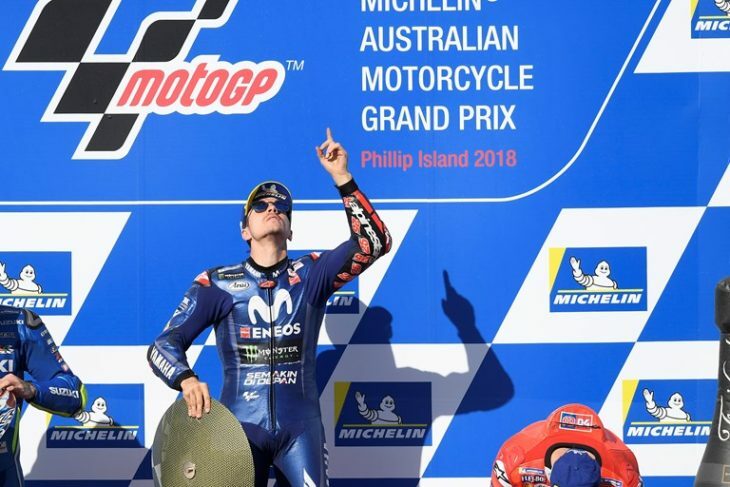 The Movistar Yamaha MotoGP Team are celebrating at the Phillip Island Grand Prix Circuit today, as they have returned to the top step of the podium with Maverick Viñales taking a stunning win. Valentino Rossi was also a strong contender in today’s Michelin Australian Motorcycle Grand Prix. He crossed the line in sixth place. VIñales didn’t have the start he had hoped for from second on the front row and slotted into tenth position after the first corners. At the end of the first lap he started to climb his way back up the ranking order, and on lap 3 he moved into eighth position. He remained there for a while, but was looking comfortable. Drama happened with 21 laps to go, when Johann Zarco and Marc Márquez collided. Unaffected by the incident, the Factory Yamaha rider used the moment to launch his attack. He smoothly fought his way through the rider field to take the lead on lap 8. From that moment on he did exactly as he predicted yesterday: he put his head down, lapping 1’29s laps, to break away at the front. Towards the end of the race the Spaniard had a comfortable advantage of over 4s, allowing him to have a bit of a breather over the last five laps. He didn’t put a foot wrong and secured a fantastic victory, with a 1.543s margin over his closest rival. As Zarco and Márquez touched going into turn 1 on lap 6, the fight for the lead heated up. Viñales took the number one spot on lap 8 and the Doctor was keen on following him. He wrestled for a bit with Andrea Dovizioso and initially came out victorious, so he could attempt to follow his teammate in first place, but he couldn’t quite keep up the challenge. A fight with Andrea Iannone cost him some valuable time, and with 12 laps to go he got swept up again in a battle consisting of five riders fighting for second place. Rossi was pushed back to fifth but wasn’t about to give up. With 8 laps to go he made another charge, briefly reclaiming second place, only to find himself in sixth again shortly after. The Italian pushed hard and had another try in the final three laps, but still finished the race in sixth place, 5.132s from his teammate. Today’s results see Rossi hold third position in the championship standings with a 15-point gap to second. Viñales remains in fourth place, and thanks to his splendid win he currently has a 15-point gap to his teammate. The Movistar Yamaha MotoGP Team will be back in action at the Sepang International Circuit next weekend for the Shell Malaysia Motorcycle Grand Prix, held from November 2nd – 4th.